Situated in Amritsar, this hotel is steps from Central Sikh Museum and Golden Temple. Akal Takht and Gurdwara Kaulsar Sahib are also within 10 minutes. This is a very nice, well maintained and clean hotel near the airport. The rooms were very comfortable. The only thing we experienced that was less than ideal was room service. We ordered salads that were hands down the worst salads we had ever tasted (partially due to being covered with plastic on the way up). Avoid room service salads and you won’t be disappointed! Where to find Amritsar hotels near an airport? Where can I find hotels in Amritsar that are near tourist attractions? 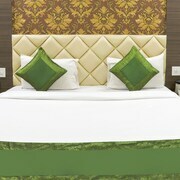 Travelers to North India are simply spoiled for choice when it comes to booking the best hotels in Amritsar. Expedia's extensive and up-to-date database contains 71 accommodation options within a 0.1-kilometre (0.06-mile) distance of central Amritsar. 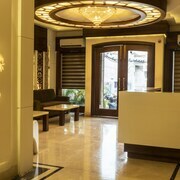 Astute vacationers who fully appreciate the importance of staying close to the bright lights and action of the city's heart should check out the WelcomHeritage Ranjits Svaasa and Country Inn & Suites By Carlson Amritsar, which are within 1 kilometre (0.6 miles) of Amritsar's downtown area. Expedia know that travelers have differing vacation budgets. If you're looking for a hotel or appartment at the more affordable end of the range, Amritsar has some solid options to choose from. The Comfort Inn Alstonia is 0.8 kilometres (0.5 miles) from the center of Amritsar, while the Hotel Narula's Aurrum is 0.4 kilometres (0.3 miles) away. Additional affordable accommodation options are the Hotel Hong Kong Inn and the Hotel CJ International. 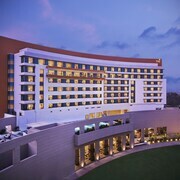 The Radisson Blu Hotel Amritsar is 8 kilometres (5 miles) from the center of Amritsar. 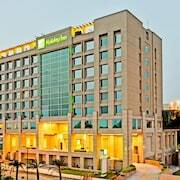 Or, alternatively, the Holiday Inn Amritsar Ranjit Avenue can be found 1 kilometre (1 mile) away. 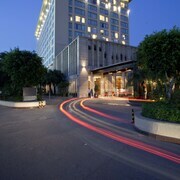 Two other hotel and apartment options in this area are the Hyatt Amritsar and the Ramada Amritsar. After you have really explored Amritsar, why don't you travel a little further afield? The North India vicinity has many attractions waiting to be explored. North India has beaches, coastal plains and forests. Popular North India tourist destinations include ruins and traditional villages. Adventurous visitors might also try their hand at skiing, cross-country skiing and snow shoeing here. The Prithvi's Planet is a often visited place of interest in the region. Find accommodation in Jalandhar, which is 75 kilometres (47 miles) to the southeast of the heart of Amritsar. 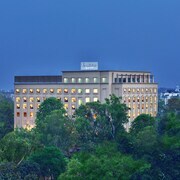 The Radisson Hotel Jalandhar and Country Inn & Suites By Carlson, Jalandhar are among your choices. Looking for the most practical airport for your stay in Amritsar? Raja Sansi International Airport is 9 kilometres (6 miles) drive away. What are the most popular Amritsar hotels? Are there hotels in other cities near Amritsar? 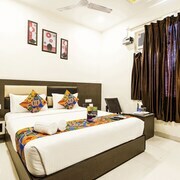 What other types of accommodations are available in Amritsar? Explore Amritsar with Expedia.ca’s Travel Guides to find the best flights, cars, holiday packages and more!